In August of 1906, the original Scajaquada Canoe Club held a lantern parade on Gala Waters, which we now call Hoyt Lake, in Delaware Park. 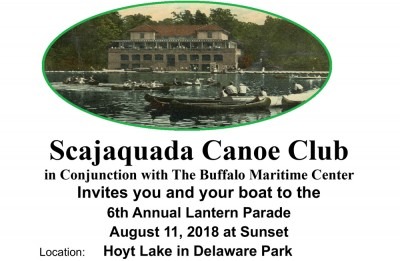 Join the Scajaquada Canoe Club as they pay tribute to that historic event by recreating the celebration on Saturday, August 11, in conjunction with The Buffalo Maritime Center. Launch your small crafts onto the lake starting at 8:00pm (the sun sets at 8:30pm and there will be a new moon on that day). Crafts should be outfitted with some sort of lantern -- lights sticks, running lights, headlights… the craft must be properly lit--it's a Lantern Parade! Rowers and paddlers should also have personal floatation devices on their boats for safety reasons.